I gerani dappertutto! Geraniums everywhere! Apparently I love taking pictures of flowers in Italy (also doors). And while technically, these photos were taken in summer and not spring, I thought they were appropriate for this spring-themed Capturing Italy post. It’s been another long winter in many parts of the world, and, wherever you are, I hope you are starting to feel the first signs of spring. 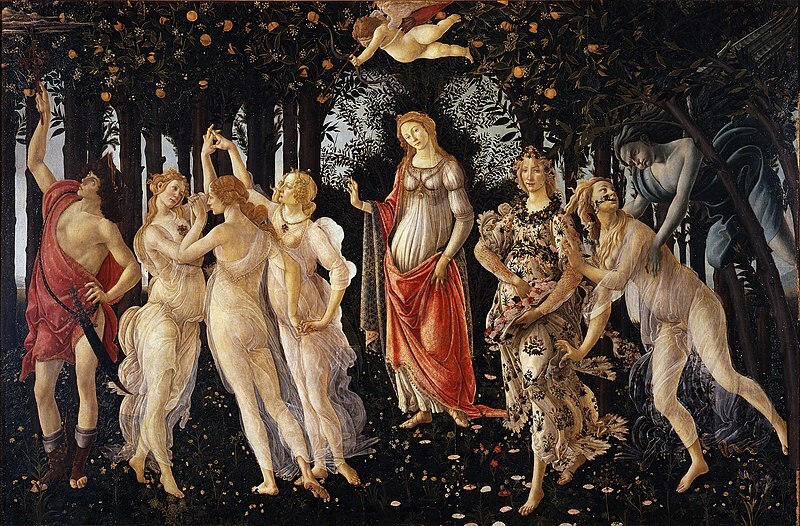 La Primavera by Botticelli is thought to be painted for a cousin of Lorenzo de’ Medici in the late 1400s. It hangs in Florence’s Uffizi Gallery. Image credit: Wikimedia Commons. “Natale con i tuoi, Pasqua con chi vuoi…” Christmas with your family, Easter with whomever you want, is a popular Italian saying. I have never spent Easter (or Christmas) in Italy (although I certainly hope to one day), so I can’t share any first-hand insight on Easter traditions in Italy. For that, I invite you to hop on over to Dianne Hales’ most recent post, Easter in the Italian Language. Buona Pasqua a tutti! Happy Easter everyone! Enjoy the beauty of spring. Tags: Capturing Italy, Italian, Italian springtime words, Italy. Bookmark the permalink.